This photo of the Old Gaines School (also known as Orebank) in Sullivan Co., Tennessee was taken around 1915. Pictured left to right, first row: Nina Kerns Hurst, Albert Hurst, Lawrence Hurst, Joe Gray, Tom Gray, Velvie Kerns Hicks, Robert Corbett Brickey, Tom Poore, and Connie Cox. Second row: Hiram Cawood, Lucy Hurst, Judy Cawood, Clara Holt Ratliff, Lucy Holt, and Myrtle Poore Hutchins. 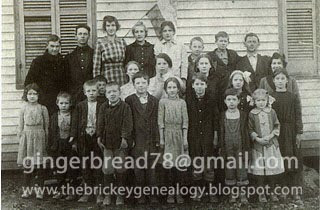 Third row: Clay Hicks, Will Poore, Lottie Brickey, Annie May Holt, Effie Poore Crane, Bille Hicks, and Emmett Brickey.